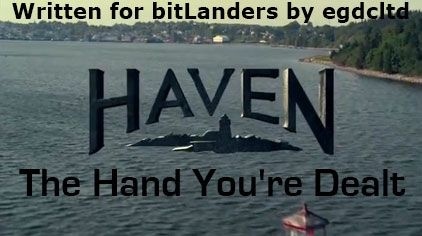 "The Hand You're Dealt" is episode ten of season one of Haven, a supernatural drama series loosely based on Stephen King's novel The Colorado Kid. In this episode, Parker looks further into Duke's connection to Lucy and a guidance counsellor keeps being around at odd deaths. This episode opens with Duke and Parker visiting the high school. In the previous episode, "As You Were", Parker found out that both Vince and Duke knew more about her possibly mother than they had let on - including her name. Duke had a pendant that belonged to Lucy, and he was the boy in the Colorado Kid photograph. They're visiting the high school guidance counsellor who Duke knew, his former babysitter Vanessa, who was also at the scene. Neither she nor Duke can remember anything about what happened that day. Duke has also tracked down a photographer, but unfortunately he's rather bonkers. Not long after they visit her, the counsellor becomes ill or something. She then tries to stop her boss, the principal, from getting into a car. Which promptly explodes when she does anyway. Nathan thinks that there's something odd, but he doesn't know about the counsellor. She later visits a swimming pool, but can't get in, then the last remaining kid, a student at the high school, is boiled alive in the pool. After her mother, Eleanor, died in the previous episode, her daughter Julia is filling in as the ME. She tells Parker that her mother made notes about the Colorado Kid murder, and offers to show them. Nathan and Parker know that there's something wrong with the two deaths, but they don't know what. Julia suggests pyrokinesis. At Vanessa's house is a lot of scribblings about guns and explosions - and a list of people, with the two dead ones crossed off. Vanessa sees the last thing people see before they die. In "Ain't No Sunshine", Nathan found that he could feel it when Parker touched him, although not anything else. He hasn't told her yet.